Even though many theories exist regarding the stages of child growth and development, one of the most respected and influential theories has been that of 20th century psychologist Erik Erikson. Focusing primarily on the psychosocial aspects of development, Erikson developed a comprehensive theory that outlines change and growth throughout the entire human life span. His theory identifies five stages of development during childhood, as well as three stages of development during adulthood. Also known as infancy, the first stage of growth and development stretches from birth to around 18 or 24 months. During this period of development, young children will primarily learn through their sensory perceptions and their visual and touch experiences of the world around them. Infants are also, during this stage, developing their motor skills and learning about the cause and effect of their actions. A child’s most important relationship during this period is that with the maternal or primary caregiver. According to Erikson, a person’s ability to believe the world is trustworthy is rooted in the experience of consistent, loving care during infancy. The second stage of growth and development encompasses anywhere from 18 months to 3 years of age. During early childhood, John W. Santrock explains in “Life-Span Development,” a young child will “begin to discover that their behavior is their own.” That is, young children will begin to assert their independence, declaring “NO” and making other choices autonomously. A child’s most important relationships during this period of development are with his parents or primary caregivers. Erikson theorized that a person develops the qualities of self-control and autonomy during early childhood. During the third stage of growth and development, which occurs between 3 and 5 years, most children begin to attend school and experience increased interactions with the world outside of their home. In play age, children become increasingly curious about the surrounding world and often want to emulate adults and older role models in their lives. The most significant relationships of this period of development are those with the child’s nuclear family. 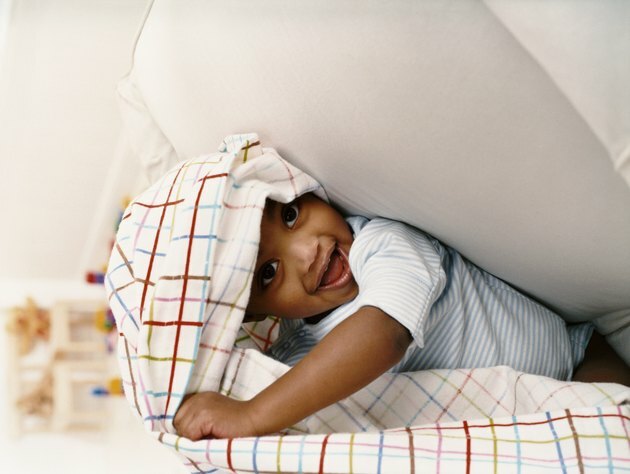 According to Erikson, children learn to take initiative for their actions during this stage, developing a sense of responsibility for their bodies and their behavior. The fourth stage of growth and development encompasses anywhere from 6 to 12 years, as children move through middle childhood and into early adolescence. During this period of development, children will often be highly engaged in learning and exploration, focusing on mastering new skills and expanding their knowledge. Schoolmates and neighborhood friends become a stronger influences during school age, while parents and nuclear families remain important as well. Erikson understood this stage of development as being key for an individual’s development of self-confidence and a sense of industry. In the fifth stage of growth and development, which lasts from approximately 12 to 18 years, children move into a unique stage in which they experience increasing choices and freedom. During this period of development, also known as adolescence, young people will devote more time to exploring different roles, paths and options in their lives, such as vocational and romantic ones. The most significant relationships, throughout this stage, are most often with peer group members. According to Erikson, a person develops a sense of identity during adolescence in preparation for moving into adulthood.